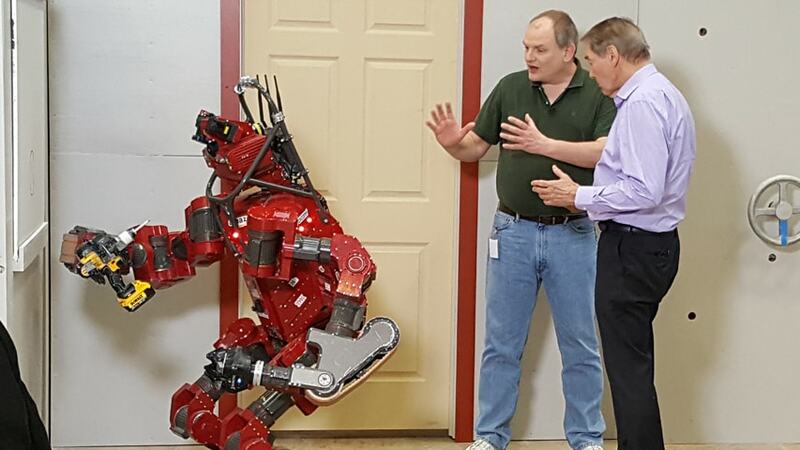 News › Stories › Archives › 2016 › October › Carnegie Mellon Featured on CBS's "60 Minutes"
Carnegie Mellon Featured on CBS's "60 Minutes"
Andrew Moore shows Charlie Rose CMU's disaster response robot CHIMP. When CBS's "60 Minutes" decided to do a two-part report on the state of artificial intelligence (AI), correspondent Charlie Rose came to Carnegie Mellon University to see the state-of-the-art work being conducted and talk with School of Computer Science Dean Andrew Moore about where AI is taking humankind. That report aired on Oct. 9. In addition to Rose's interview with Moore, the report featured the National Robotics Engineering Center's autonomous boat; the CHIMP disaster response robot; and the Computer Science Department's Gabriel, a wearable cognitive assistant. Carnegie Mellon also is highlighted in an online-only 60 Minutes Overtime report, in which the university is described as a "wonderland of innovation." Robots including HERB the robot butler, snakebots and Land Tamer, an autonomous ATV that was part of a U.S. Army demonstration last year, are shown in this video. Moore will participate in a panel discussion, “Challenges of AI,” during the White House Frontiers Conference at CMU and the University of Pittsburgh on Thursday, Oct. 13.